Over 50 years ago Lucia Pamela loaded her pink Cadillac up with some musician friends, a slew of instruments, a weird batch of space ballads, and headed for the moon. Their mission? Not some pre-Apollo scientific space exploration, but rather the first, and possibly only, interplanetary recording session (unless, of course, you consider some of Sun Ra's early intergalactic jazz explorations). The product of this expedition was the now legendary Into Outer Space with Lucia Pamela in the Year 2000 (Lucia was apparently a time traveler as well). Lucia insists Into Outer Space was recorded on the moon. Not only that, she's not entirely happy with lunar acoustics. "The air is so thin everything sounds different up there", she once noted in an annoyed tone. Certainly those primitive recording facilities contributed to the unique sound of Lucia's crudely recorded cult classic. How to explain the sound of Into Outer Space? For starters, one critic called Lucia the "missing link between Sun Ra and the Shaggs". That's a start, but it's nowhere near the complete story. Lucia isn't nearly derivative enough to be neatly pigeonholed between other artists, no matter how out-there they may be. Approximate the following and come to your own conclusions. 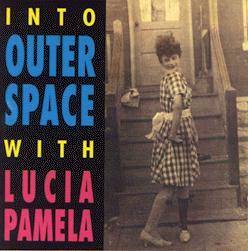 Into Outer Space with Lucia Pamela is the sound of a ragtime band lost in another galaxy, hopelessly whacked out on alien hallucinogens, desperately trying to pull together history's strangest concept album. Which is exactly what Into Outer Space is -- a startlingly weird concept album. The premise: Lucia pays a visit to Moontown and reports back on her findings. An Indian wedding. More oriental people than she expected. Lots of animals. No taxes. A virtual paradise. Except of course for the recording facilities. For those of you having trouble visualizing Lucia's adventure, the entire mission was documented in the extremely rare Lucia Pamela Coloring Book. The book is central to the myth and legend of Lucia Pamela. It's a sci-fi-folk-art adventure story, complete with smoking dogs and nut people. Thanks to the wonders of modern technology, you too can have your very own copy of this amazing work of art. Just download the complete coloring book (3.8 MB) in the convenient Acrobat file format. You can view and print the file with the free Adobe Acrobat file reader. It's worth noting that Lucia is sponsoring an international coloring contest. It's been going on since 1969. She's still accepting entries because she doesn't want to rush anyone. So take your time, but remember to send your entry. The coloring contest was memorialized in a brilliant song by the British band Stereolab. "International Colouring Contest" sounds like it might have been the theme to the Lucia Pamela Variety Hours, circa 1959. You can hear the song on the group's "Mars Audiac Quintet" LP. While Into Outer Space was Lucia's first (and apparently only) commercial release, her long and illustrious musical career is recounted in vivid detail in the original liner notes to Into Outer Space with Lucia Pamela. My personal history with Lucia is briefly recounted in the reissue liner notes. If any of this musical weirdness sounds even remotely interesting, you owe it to yourself to find a copy of the Into Outer Space With Lucia Pamela reissue. NEWS FLASH: Arf! Arf! Records is now on-line.